Rank On Google's First Page In 24 Hours! 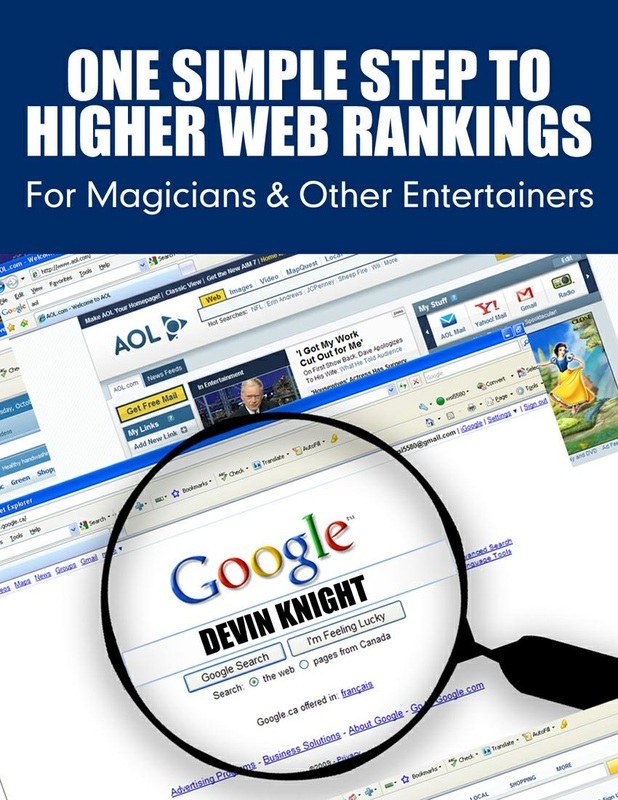 This is e-book #4 in Devin Knight's "Magic Marketing For Magicians Series." 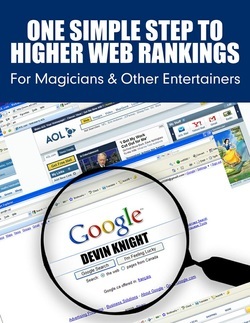 This book contains a new, never before revealed technique that will catapult your website to the first page of Google searches in one simple step. This is my most closely guarded web secret and I have used it in the past to get clients on the first page of Google when everything else failed. You will not find this method in mainstream SEO books, because this is a technique I created called "Piggybacking" and it will get you on the first page of Google searches for performers in your area. In most cases, it will put you near the top of the page and over your competitors.The nice thing is that you can do this yourself without having to hire a web designer. You don't need to know anything about SEO (search engine optimization). Do this one simple step yourself and you will rank on Google's first page. In the past, I have charged clients up to $500 to use this secret technique. You do this without paying Google for Adwords. Despite all the recent changes that Google has made in the past few months, this white hat technique has worked only better. EVERY WEBSITE I HAVE AND ONES THAT I CREATED FOR MY CLIENTS THAT USES THIS TECHNIQUE ARE ALL ON PAGE ONE OF GOOGLE SEARCHES! Because of all the new changes to Google, many performers have noticed that their sites have vanished from the first few pages. However, "Piggybacking" using this technique still works. In fact, after the changes Google made, some of my client's websites now are in position 1 on page one of Google searches! This secret technique will allow you to rank for those difficult to rank keywords. This is a short and simple to understand book that is not written in technical terms. After you read this book, which is only 20 pages, you can implement this simple step immediately and start ranking on page one of Google searches. This technique works and I give case histories in the book showing how websites using this are on the first page with photographic proof. In many cases, you can do this free of charge, and in the book I will show you how to get a domain with those tough to rank keywords, EVEN if your competitor already owns that domain. This is information YOU DO NOT know and is way under priced for this valuable information. Remember, you don't have to hire a webmaster or web designer. You can do this yourself at NO Cost or a very low cost for about $4.00 a month. A bargain to be on the first page of Google searches. SEO firms change anywhere from several hundred to several thousands dollars a month to get a business on the front page of a Google search. Now you can do it yourself with this easy to follow guide for less than a price of a night on the town. This information works for any performer, be you a magician, clown, balloon artist, or face painter. Your website can be on the first page of Google. Even a non-entertainment business can get on page one of searches using this information. This information works for anyone who wants to be on page one of Google and other search engines. Important Update: As of April 21, 2015, Google has made a major update that affects every website. Unless your website is deemed to be mobile friendly, then Google will penalize you for it. That means, though your website may have been on page one of Google searches, it could vanish from search results effective April 21, 2015. That is bad news for a lot of website owners. The good news is that if you bought this book in the past and implemented the technique described, then your website is automatically compliant with the new Google algorithm. If you are looking for a quick and easy way to make your website mobile friendly without having to spend hundreds or even thousands of dollars with a professional web designer, then this book could do the trick for you. Any website built using this technique will be mobile friendly. Sent as a PDF to your e-mail within 24 hours of purchase. Way under priced at only $14.95 Click below to order via PayPal or credit card. You can use PayPal or e-mail your order. You can also call me direct. I accept Master Card, Visa, and Discover Card. If you wish to e-mail your order, split your number into two e-mails. I need exp date and security code on back of card. Join my mailing list and get news & discounts on my latest releases.